This book explores the emergence of African Union (AU) law as a legal order and its implications for existing order in the region. As an authoritative text on the development of AU law, the book covers such pertinent issues as legislative powers, competences, direct effect in AU law, subsidiarity, interventionism, and enforcement of laws. 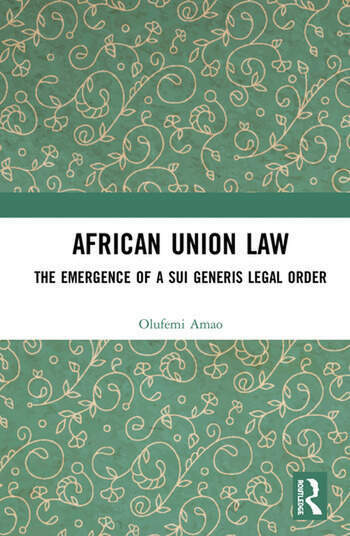 Olufemi Amao argues that there is a gradual movement from intergovernmentalism to supranationalism in the African Union legal order, and explores how this trajectory gradually and incrementally de-emphasises the discourse on nation state sovereignty; a concept that has caused many problems in the African context. Drawing upon EU law as a comparison, the book also examines how the development of supranationalism affects crucial issues such as human rights, democratic reforms, territorial matters, tribal and religious disputes, and economic relations. As a comprehensive examination of the development of law within a union, this book will be of great interest and use to students, scholars and practitioners in international law, international relations, and African studies. Olufemi Amao is currently Senior Lecturer at the Sussex Law School, University of Sussex. He was previously a lecturer at Brunel Law School, the director for Undergraduate Studies, Brunel University, London, and a lecturer at University College Cork, Ireland. He is the author of Corporate Social Responsibility, Human Rights and the Law: Multinational Corporations in Developing Countries (Routledge, 2011).